The Reader Top 30 has likely seen the last majority winner. It’s also quite possible that we have few plurality winners that exceed 30%. Rhys Hoskins’ selection as the organizations’ #11 prospect may be indicative of how contentious the remaining votes will be. Hoskins won comfortably with 122 of 440 total votes cast. He almost doubled the votes cast for 2nd place finisher Ricardo Pinto (66 votes), but Hoskins only garnered 27.7% of the vote. Rhys Hoskins went undrafted out of high school and attended California State University at Sacremento. He was drafted after his junior year by the Phillies in the 5th round of the 2014 Amateur Draft, the 142 pick overall. 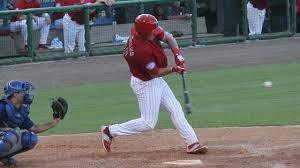 Hoskins was sent directly to Low A Williamsport where he slashed .237/.311/.408/.720 in 70 games. He hit 9 HR and had 40 RBI. He had a BB rate of 7.7%, and a K rate of 20.1%. Hoskins began 2015 in full season ball at Lakewood. He slashed .322/.397/.525/.922 with 9 HR and 51 RBI. His BB rate was 8.97%, and his K rate was 17.2%. After 68 games he was promoted to Clearwater. Hoskins continued to produce in Advanced A. He slashed .317/.394/.510/.904 with 8 HR and 39 RBI in 67 games. His BB rate was 10.5%, and his K rate was 17.7%. Hoskins traveled to Australia for winter ball (actually their summer league) and continued to mash. He has produced a .306/.375/.516/.891 slash with a team leading 8 HR and 38 RBI. His BB rate is 7.2%, and his K rate is 14.9%. His Sydney Blue Sox have 4 games left in the regular season and are not likely to reach the post season. Hoskins might be the most divisive prospect in the system. Those who like him love his bat. His detractors question his position and right-handedness. Regardless, he has put together a heck of a year hitting .316 with 25 HR and 128 RBI. He’ll need to continue to produce at a similar rate at AA and AAA to make it to Philadelphia. I have a recent request to add Brandon Leibrandt, and have already received requests to add Severino Gonzalez, Luis Encarnacion, Josh Tobias, and Yacksel Rios. Maybe a couple of thes guys make it to the poll next week. I have recent write-ins for Moore, Asher, Martin, Harris, Canelo, and Cordero. Also Walding and Ruf. And Tom Windle received votes again. This time 9 which is triple his earlier highest count. Next up is your selection for the #12 prospect in the organization. Ricardo Pinto here again. I’m going to get “Mean As Sh#%” and his number on a shirsey when he makes the bigs. Get two. On the second, instead of his name and number, have his name and Kiley’s second quote with “has” instead of “having”. Kingery or Tocci would be good choices here. I have a feeling Kingery will be the breakout player this year and drive a lot of the conversation. I like both of them. I hope they both break out. I think a lot of fans are down on those two. Tocci because he’s been here for what seems like forever and Kingery because he didn’t have eye popping stats this year. I like Tocci, then Canelo. Canelo is ahead of Kingery to me because he’s younger, played at a higher level (A+ Clearwater > A Lakewood) and is much better defensively (SS > 2B). But Kingery is up there. @anonymous – i hope you’re right – his stats doesn’t say it yet, but i think he’s a good hitter and a gamer. i’m not being sarcastic, because i’m also high on Kingery (i have him #12 in my list list behind Pinto #11). i’m not just beating the drum as loud as you do. I’m not beating the drum for Kingery. I have him 14th or 15th on my list. He’s just one of the few players left that I believe may have a ceiling of Major league regular or Starter. I went with Kingery this time and will go Tocci next. I think we might see a break out from Tocci this year. After this, choosing names is like picking them out of a grab bag to me. Why is Canelo below Kingery and Tocci on your list? Canelo is probably lower on my list due to nothing more than my own ignorance of his tools. He and Tocci were basically the same offensively, last year. Canelo has the edge in defensive value, and Tocci the advantage in age. I just don’t know how Canelo’s tools are projected. I don’t have enough information to make me comfortable placing him higher than those guys. He’s in my top 20, ahead of at least one guy, already voted onto the list though. I’d love see someone make a case for Kingery or Roibal. I’m not bearish on Kingery, but I read so many conflicting things about him. If the reports that say he has two plus tools, including hit tool, he deserved to be much higher in this poll; certainly higher than Tocci or even Hoskins. And I’d like to know more about Roibal, preferably from someone who’s watched him pitch. He hasn’t garnered much discussion on this board–and I reckon his age has a lot to with that–but his numbers are good, and he was chosen to be added to this pool. Speaking of having been added to the poll–Aaron Brown? He might not even make our Top 50, let alone Top 40. Btw, I didn’t actually vote for Windle last time. Just promoting Gopher Baseball. Go Gophers! I did vote–and am voting again–for Darnell Sweeney. Not the highest upside, probably won’t amount to more than a utility 2B-OF with some pop. But also a low floor, and will contribute at the ML level. Hope I’m not voting for him too long! I think people think about Sweeney and his bad time in the majors last year. I think he opens the season at AAA and hopefully he breaks out and makes it to the majors with much more success than last year. Roibal is probably not top 50. Older Cuban that bounced around out of organized ball for a couple of years. No longer throws as hard as he did when he was younger. Nice filler but in a deep system he really is not much of a prospect. My next two are Pivetta (very underrated) and Tocci. Roibal throws very hard and is my dark horse to be a surprise mid season bullpen arm in Philly. He was very good last year and has a durable arm. I can’t figure out where he came from (Cuba obviously). His fastball has been reported in the upper 80s to low 90s lately. Used to tough the mid 90s when he was signed but today it is pretty pedestrian velocity for a right handed reliever. He is a nice story that may get a cup of tea at some point, but there is nothing to suggest he is a prospect. He was released and bounced around Indy ball for a couple of years. Nope, he throws in the mid 90s – I was at a game last year and he sat 94-96 all game; he can bring it. Reading may have a hot gun. It does, but not that much, maybe 1 MPH – he was still throwing pretty hard. I think he was hurt for 2 yrs then signed with the philles. 2. I have personally witnessed him making great defensive plays that show range and arm. 3. He clearly has great contact skills as supported by his college stats. 4. He has some pop. 5. He plays a position where the offensive bar is very low. I see Jose Altuve as a realistic comp. Aaron Brown hit very similarly to Cozens in Clearwater last year and is a better defensive player. It would be a joke for Cozens to get a top 15 spot and Brown to not get a top 50 spot. If Cozens is voted higher that’s fine, but Brown should be on the poll. Sweeney is interesting. I’d like to know if the Phillies plan to get him more reps at 2B or if they see him as a full-time OF. Being able to play 2B would make a big difference. Brown will be on my list somewhere. I didn’t think much about him until seeing him play at Clearwater last year. He’s a solid athlete. He’s one of my candidates for breakout player this year. Sweeney is interesting, and I have to admit not giving him enough thought. However, there’s a lot better looking outfield prospects, plus incumbent Phillies, and I don’t know if any better a second base prospect than Kingery, Canelo if he plays 2B. And Cesar Hernandez is young and can improve. I’m going Pinto or Kingery both are A1 and A2 on my list . Pinto backers he’s 12 on Winks list and 11 on baseball IQ with is USA Today. Kingery I’ve been since the start my 1 of my breakout guys . There the only 2 left in my top 11. @Tim – agree with you. I still go Pinto here (he’s my #11, then Kingery #12) but would not be surprised if Kingery or Tocci will go #12. #11 to #15 prospects current value are almost similar. When the poll comes up I will vote for Pinto; then I am thinking Pivetta and Roibal. I have have read the comments about his height, but he does have a plus fast ball, which he commands well. He has a good slider, which can be an out-pitch. He has been outstanding at every stop along the minor league road. He should not slip below this spot. It would be interesting to actually see an A ball pitcher with 2 plus pitches that only strikes out 5/9. Must be rare as the Loch ness monster. @Romus – the Fightin Phils will unleash Nessy Pinto this spring. lol! I’m still a believer but the leash is short. Fall back is still a solid BP arm, which I think is similar to Pivetta. I don’t belive the Loch Ness monster exists and I don’t believe a pitcher (who has two plus pitches) exists that can’t strike out A ball hitters. KuKo……remember Lisa. Bonilla 4/5 years on our poll? He had a similar profile..physical and arsenal.. to Pinto at the approx A level,and he eventually went to the pen. Romus, Excellent example of a smallish pitcher who truly had Plus Fastball, Plus Change and good command. A ball hitters can’t hit plus offspeed pitches with command. After this participating in my 6th or 7th PP readers poll, I have, unfortunately become pretty callous to my ‘prospect ceiling expectations’. I like to think the excitement and hope is there for the prospects, but the reality of the matter sinks in. Read what Matt Winks wrote about him . When he went Clearwater they made him use his slider more that’s why his k rate went down. His best month was August when everything started to come together. Mean as &alls attacks the hitters with his CU and FB . He started the last game when Clearwater won the first half. He started there First playoff game. He great has no fear pitching mentally again minor league pitching stats can be very misleading. His control is good and his hit per 9 was better in Clearwater . Right now the Phillies are looking at him as 3 or 4 starter That could change depends on his 3rd pitch. Pinto also pitched 145 ings we will see what happens in Reading he will be 22. Since I’ve gone to Windows 10, I have intermittent problems with the poll. This morning I can’t even see the list of guys to vote for. It’s a pain in the @$$. Needless to say, if the poll needs one more vote, I vote for Pinto. Jim, please take note. I can’t see the poll either,and I use windows 7. It’s not a Windows issue, the poll is down. Yup, there’s no poll on my computer either. For what it’s worth, I’ve got Tyler Goeddel next. He’s very athletic, plays key defensive positions, has speed, has good plate discipline and really came on at the end of last season, hitting for power and with a good average. If he had been drafted by the Phillies I think people would be a lot higher on him. I also like Mecias, Kingery, and Sweeney around these spots; I forgot about Canelo when I did my list before, but he’s also in the conversation in the mid-teens to around 20; he’s a good, solid prospect and I think he’s going to be a major leaguer, the question is, in what capacity? I know a lot of folks like Cozens and I don’t hate him as a prospect, but I’m not sold on him yet. He’s one of these prospects where people see what they want to see and ignore or downplay the negative stuff. Except for a very short hot spell in Reading, he really has not been especially good at the plate and he sounds, at best, like he’d be average in the field. I think is the year we find out if Cozens is for real – as a corner outfielder he needs to hit like hell to justify a position with Altherr already in the bigs (and doing great there in his brief audition) and Nick Williams on the way. I don’t know, but I’m not seeing the big bat he’d need to justify a position in the majors, but he’s got a little more time to prove me wrong. 55 would indicate Cozens could be an above-average regular right now in the bigs. No way. I wouldn’t even give him a 55 FV at this point … way too much risk. To put it into perspective, prospects who received 55 FV in Fangraphs midseason rankings last year include: Aaron Judge, Dansby Swanson and Clint Frazier. I do not have him at 55FV. it is right now as he stands in A/AA level. This pre-2015 Kiley McDaniel Fangraphs rating has him at overall 45FV, along with Roman Quinn. Do you have the mid-season link where he is rated? Yeah, right now, for majors, I’d have him Hit:40/50 – Power: 40/60 – Run: 45 – Arm: ?- Field: 45/50. Right now, I’d have him at a 40 or 45 – below average and, with a guy whose primary asset is his bat, there’s no place for him as a 40 or 45 on a big league team. The big question with him is whether he can improve the hit tool to the point where it is roughly MLB average and improve the power tool to the point where it is plus. If he can’t do that, I don’t see how he mans a corner outfield position going forward. By the way, with all the Hoskins discussion, I view him a little differently. People are saying that if he can’t hit 25-30 homers he probably doesn’t have a place in the majors. With Hoskins, I’d disagree. Hoskins already does two things a lot better than Cozens does right now – that’s hit and get on base. I understand that he’s also an above average fielder, which is helpful, and his in game power is decent and development. Also, power is in short supply in the majors right now, if Hoskins hits 25-30 home runs he’ll be a whale of a player in the current environment. But even if he hits, say, 18-25 he could be just fine. Take a look at Eric Hosmer’s year – 18 homers, .297 average, .822 OPS and a 3.6 WAR. I’d take that in a heartbeat and I don’t think it’s outside Hoskins’ projections. Maybe Jimmy deleted the poll when he took Eflin off. I mustve been banned from voting because Ive had too many wrong answers! Unrelated but….. I love the way Mccannin talks the truth. Pinto here for me. Yes he’s small but he knows how to pitch and gets outs. Why Cozens over Goeddel? Similar offensive production to this point, but Goeddel has much more defensive value and versatility. Sorry for the inconvenience. I think I had 2 windows open at the same time and after I deleted Eflin and added 2 photos, the other window auto-saved over it. Or blame it on the Golden Monkey. Tocci here. I’ll thrilled to be able to take major league ready defense at a premium position, plus room for growth as a hitter, at this point in the list. It’s funny that he’s trailing Kingery, who is older than him, played at a lower level, showed less success at it than Tocci did at a younger age, is limited to a less premium position and … did I miss anything here? Kingery might be poised for a breakout season, etc, but I think some people are just excited because he’s new. Tocci has been around so long that people are kind of tired of him, but he’s still only 20–I feel like I’ve been writing sentences that begin “he’s still only” forever–and he has showed a slow, steady progression at the plate. He could spend another year at Clearwater and a full year at Reading and would still be on a reasonable pace to reach the majors (although at some point he’ll have to be added to the 40-man). Agree that Tocci is under-appreciated, and I voted for him again here, but I wouldn’t mind if Kingery comes in ahead of him. I don’t put a ton of stock into the numbers a college guy puts up in his first partial season. I just see that the K% and BB% look fine, and he stole 11 bases in 12 attempts, so he showed some aptitude on the bases. Agree 100 percent. Tocci was in his 19 yo season in full time A ball playing premium centerfield and mashed. The fact that Cozens is leading him is laughable to me. Kingery, I can see the rationale for ranking him higher than Tocci but I would not. Power is a “game changer” tool, thus, some poeple tend to overvalue “power” – so hoskins, ortiz and cozens might rank higher in some who values power a lot. while Cozen’s stats may not show it, Cozens physical profile screams “raw power”. so i will not be surprised to see people ranked him high especially after a solid 2nd half. in my personal rankings, i have Hoskins #14 and Cozens #23 which is probably lower than the fan poll results. Your logic on positional value is backwards. Last year there were six 2nd basemen in all MLB with a 3+ war. There were 11 CF with a 3+ war. Point is, it is harder to find, and thus more valuable to have, a great player at 2b than CF. But point taken with regard to scarcity. That’s especially true within the Phillies system right now. So why don’t I resolve my comment to say that they play roughly equal positions in terms of defensive value, perhaps with Kingery having a slight edge. But Kingery is by most accounts nothing special defensively, whereas Tocci is very good already. So therefore, you have to give Tocci the edge there, even without taking into account his higher level/younger age. And while I realize that it’s probably unfair to hold Kingery’s small number of at bats against him, it still means something to me that Tocci *did* handle that level very well last year. So I would say this is more of a vote for Tocci than a vote against Kingery, who I think is a very nice prospect who could very well break out next year. I agree with most of what you say, but 2B is not equal to CF in defensive value. That’s why you don’t see 3 WAR 2nd basemen, but guys like Inciarte and Herrera are 5 and 3 WAR players. Ok, fine, I’m happy to concede the point. It doesn’t alter my general feeling that Tocci is a better prospect. Even if 2B ranks just above CF in Bill James’ defensive spectrum (I had the positions transposed in my mind), the difference isn’t so big that it outweighs factors in which Tocci has a wide advantage, the main one being age but also demonstrated hitting ability at the Low A level. There is an interesting argument that you might have about whether Kingery is more valuable to the Phillies, specifically, because he plays a position where the team has no other decent prospects, as opposed to CF, where there are several players that have as good or better profiles than Tocci. But that doesn’t alter my view that, in a vacuum, Tocci is the better prospect. Yeah, no argument from me if you have Tocci above Kingery. I’ve got Goeddel, Kingery and Tocci all bunched together. Any one of them, Medina or Sweeney could be a good pick here. Kingery started college in center then moved to 2nd . He also has plus, plus speed and a good arm. High school he played ss and was on BA regional team with Cozens. So his def Value maybe 2nd for now he does have experience with other positions. Did anyone see a list of who the 9 players were who were brought in last week? Williams and Appel did interviews so that leaves 7 others. Anyone see a report? I had heard its all of the invited players they are bringing to spring from their prospects. In other words guys that are close to the majors but who will start in AAA. The list is in the news section on the Phils sight and I think all of them are listed on 40 roster with double asterisks next to their names. Thompson, Eflin, Quinn, Alfaro, Knapp, and can’t recall the last name. Oh dah…what about their top prospect Crawford! Forgot the obvious one. Tocci and then Pinto and Cozens. I still need to see some productivity from Kingery before slotting him this high. However, he has a great opportunity to rise quickly this year. Zach Green healthy and to report early to spring training. Where does he rank among prospects after losing most of last year? He might be the forgotten man? On Zach Green….is he slotted for third base or first base? Don’t know. PhlliesNation calls him a third baseman but I assume that’s because that’s where he’s mostly played. Apparently, he is healthy now and Green could be a candidate for a break-out guy this year if he remains healthy. Biddle probably will not see the mound until August/September and probably no live pitching until winter ball, if he goes. Haha what number would that be? Pinto here, then I am still undecided. I want to believe in Tocci, but far from convinced. I believe, as I said before, that Kingery is like a Cards prospect who hits everywhere and knows how to play baseball, and I believe Windle will definitely be in a Major League bullpen, but not ready to rank him here. Goeddel may be another Dooby so merits consideration here also. The good news is that they and about 7-8 others I consider legitimate prospects that would have been in the top 10 in other years. If I were going to pick a pitcher here (or at 10), it would be Ben Lively. Eflin doesn’t strike out enough hitters. Pinto is too small. I will respect the board and wait to vote for him, but among the pitchers I like Severino Gonzalez next after Lively because of his youth and track record. He was 5 years under the average age in the International League. He was the 4th youngest player in the major leagues last year and pitched for one of the worst teams and worst fielding teams in baseball, so I don’t hold his high ERA in 7 starts against him. He did win 3 games and had a respectable 4.50 FIP. I expect him to improve his command and think there is a chance he adds enough strength to get his fastball back to averaging 91 when he is 24 in 2017. He used to throw harder, so he must have the mechanics for it. His control has always been outstanding with 1.7 BB9 in his professional career, so I would not be surprised to see him turn that into exceptional command. But, I am not as high on any of the pitchers after Kilome, Appel, and Thompson, compared to Tocci, Canelo, and Kingery. Then I’ll go something like Lively, Gonzalez, Medina and hitters like Cozens, Goeddel, Grullon, and Valentin (another forgotten man). I can’t see thinking about a reliever until they are all off the board. This is the first year 2008 or before that I did not make up my own list prior to voting, so instead I’m thinking about it and reading the comments as we go. Pivetta performed better than Lively at a younger age at the same levels and has higher grades on his pitches. Both will probably be relievers, but Pivetta’s stuff may allow him to be a back-end type. Valentin might well be the forgotten man. He played well last year when he finally got to play. Maybe a low ceiling compared to some others. But maybe not. Cozens played at a higher level (CLW/READING), played better and is the same age as Kingery…he also has bigger upside with power….just sayin..i mean i know Kingery plays a premium position at 2nd but i also dont understand Tocci being higher, Tocci is only a year younger than Cozens..whats your guys reasoning for this?